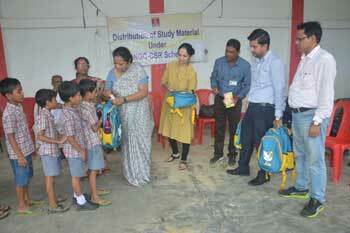 Mixed with the motherly love, affection and blessings Mrs MousamiSingha Roy, President of ONGC officers’MahilaSamiti (OOMS) and her team members distributed study materials to the Students of two schools of Anandagar Area of Agartala on two consecutive days. On 5th July the OOMS Team distributed educational kits to 156kidsof Srinagar KabiSukantaVidyalaya( Primary Section) and the very next day they made 212 students of Primary Section of Ananda Nagar HS School happy. Joy was unbound for those, who were benefited by the benevolent gesture of the better halves of senior ONGC executives. Leaving their busy scheduledof household chores the OOMS team member lead by its PresidentMrs.Singha Roy, went to the schools both days at the wee hours of the morning, with truck load of study materials. The schools are located near ONGC E-1400 X Rig. Each pack for the individual student contained one School bag, one water bottle, one umbrella, six numbers of exercise books. Mrs.Singha Roy said, “it gives us immense pleasure and a sense of satisfaction whenever we distribute educational materials to the needy students. Our endeavour to educate all will continue”. School teachers and the Panchyet members, guardian of the students from nearbyvillageattended and appreciated the noble efforts of OOMS Agartala.